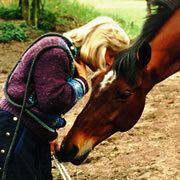 The word “Kindness” has not been commonly associated with the training of horses. Kindness requires a level of understanding that I believe has been missing in the field of equine behavior. In the last decade there is so much more information available to give us a better understanding of horse behavior. I just finished a delightful week-long Companion Animal training in New Jersey with 22 enthusiastic participants from 11 states. We had lots of fascinating dogs and 2 kitties visiting us during the week. We spent some many delightful hours in the May sunshine on the grass and under the shade trees on the back lawn of the Grange working the dogs through the Playground for Higher Learning exercises – in the Labyrinth, over the balance beam and the star obstacle, over unusual footing, through cones and over ladders. It was very rich in learning experiences.